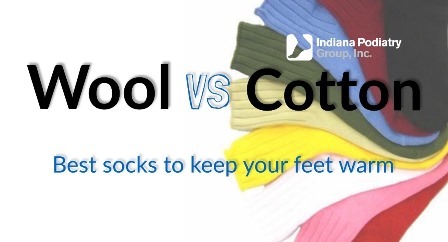 Should You Wear Wool Socks or Cotton Socks? Its not as cold here in Indiana as it is in Iowa, take it from me, but it is cold enough that your feet may suffer. We often wear coats, and scarves and of course your mom always said to cover your head but what about your feet? They happen to be the furthest from the heart so the blood flow here has a long way to travel to get those toes warmed up. Here are some good socks you should consider for this ongoing winter season. Firstly, don’t just double up on regular cotton socks but instead wear wool socks. You can shop for trendy appearing ones or you can go to TSC and pick up hunting or thermal work socks. If you’re up to it, try alpaca wool socks for a more luxury feel and if you want to avoid the itchiness of wool, make sure you get merino wool. The best thing about wool versus cotton is that cotton just causes your feet to perspire and thus leaves your feet damp and cold. Wool naturally wicks moisture away and it dries quicker than cotton. Wool insulates your feet and they are odor resistant because the fibers have natural anti-bacterial properties.